Thanks to everyone that stopped by at the booth (our little, orange smartphone holder was quite a hit!). It was the first time for MailUp at this e-commerce-focused trade show, and there is a very specific reason for that: we are making e-commerce a big area of focus for the company, and are committed to making MailUp a particular effective tool for e-commerce merchants. 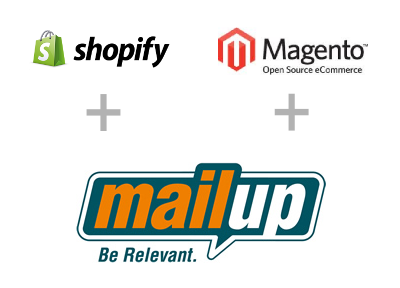 Our updated extension for Magento, which makes it a breeze for Magento stores to transfer e-commerce transaction data to MailUp, for smart, automated, post-purchase messaging. The extension also takes care of synchronizing email newsletter subscription preferences, and makes it easy to export targeted groups of customers from Magento to MailUp, based on purchase history and other variables. The new integration with Shopify, which enables Shopify-powered stores to also leverage MailUp for automated, post-purchase messaging. Custom integrations with MailUp, using the MailUp API, to take advantage of features such as advanced filters and triggered messages, which MailUp makes available to customers starting at under $100/month. Many of these sophisticated tools are only available at much higher prices elsewhere. Stay tuned for many additional blog posts in the upcoming months in which we’ll discuss how MailUp can help you increase e-commerce sales through smart messaging features and new integrations with popular e-commerce platforms.